To disburse aid to students or refund it to source, you must run it in a batch. 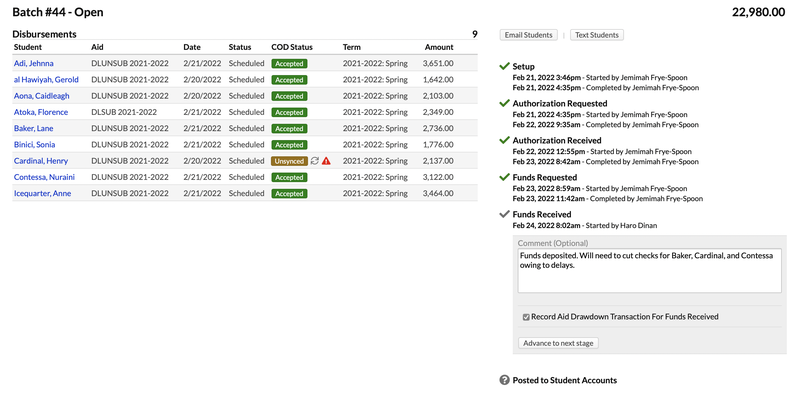 Batches collect scheduled aid transactions (disbursements or refunds) and help you apply them to student accounts. Disbursement batch workflow: When disbursing aid, in what order does your school process funds? Do you first disburse to students and then draw down funds from the source, or do you first draw down funds and then disburse to students? If processing FSA entirely through Populi, then you'll need to have the DOE integration settings completely filled in. The batch workflow involves two phases. In the first, you filter through the scheduled disbursements to find the awards you wish to include in the batch. In the second, you record the steps involved in drawing down funds and finally apply those funds to student accounts. Start by going to Financial Aid > Awards > Disbursement Batches. Start filtering the scheduled disbursements. If your school has more than one campus, your first option will be to select a campus. Select the Disbursement as your batch type. Check the award types you'd like to include in this batch. Enter a date range to search for disbursements scheduled for a particular timeframe. As you add filter selections, the disbursement list will automatically update. Check/uncheck individual disbursements to include in your batch. If the student's aid application is not yet completed, disbursements cannot be included in the batch. When your batch has captured all the transactions you're after, click Create this batch. You'll be taken directly to the batch processing page. You can find it on the Disbursement Batches view; to access it, click the batch number. An alert will display on your Populi > Home page for all unfinished batches (all financial aid users will see these alerts). The batch workflow consists of advancing the scheduled disbursements through the stages of drawing down funds and disbursing them to student accounts. The order of the stages depends on what you've set in the Disbursement Batch Workflow setting. ...you're using the DOE integration. In that case, certain stages will trigger updates to COD. See the batch instructions (below) for details. At any point, you can click Email/Text Students and send a message to the students included in the batch. Financial Aid users can run batches through the following stages: Setup, Authorization Requested, Authorization Received, and Funds Received. The Financial Admin role is required to complete Funds Requested and Posted to Student Accounts. Batches begin in the Setup stage, during which you can click to remove disbursements or cancel the batch. Once the batch moves past Setup, these two options will disappear. For each stage, you can enter an optional comment. Comments are for your own internal use; they will not be emailed to the students. To move to the next part of the batch, click Advance to next stage. indicates that the stage has been started—it has not affected any student accounts (or COD information) at this point. indicates that the stage has been completed. If the stage affects anything else in Populi or COD, this means that change has happened! If syncing awards with COD, and depending on your Disbursement Batch Workflow (see above), the Released indicator for the disbursement's COD information will be set to Yes in either the Authorization Requested or Mark Released in COD stage. When this happens, your Current Funding Level in G5 will be changed so you can draw down the funds to cover those disbursements. Funds received: When you transfer the funds from the source to your own account, you should record a Journal Entry. Debit the asset account into which you've deposited the funds and credit the liability account tied to that aid award type. Posted to student accounts: The scheduled disbursements are applied to the students' invoiced, aid-eligible charges. The Manually... and Auto-apply... financial aid settings can change this behavior. When you post the disbursements, you can email the students to inform them. When you're all done, click Complete Batch. The batch is now closed and no further action on your part is required. If refunding aid to source, refer to this article. If refunding aid to the student, you'll use the Refund Credit Balance workflow.